finally made it to my house! AND, my apologies for not finishing out my December IBD challenge. A very hectic schedule + being pregnant (and all the normal aches and pains that come with it) on top of being sick just was not a good mix! 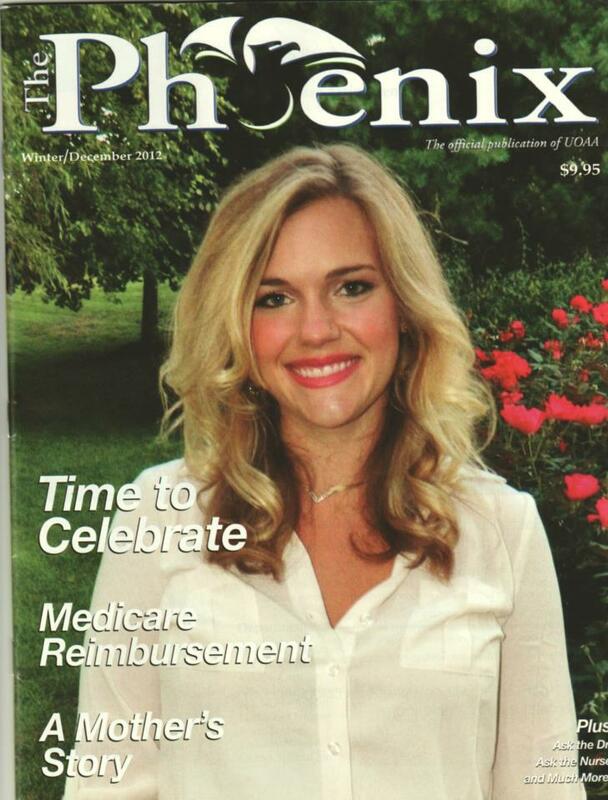 Alexis was diagnosed with Ulcerative Colitis in August of 2010. She was three years old. I had never heard of the disease, and was very confused when the Doctor explained that it was a “chronic” illness. How does something like this happen to someone so young? She’s never even had an ear infection, but she has a badly inflamed colon? In my mind, I had imagined the colonoscopy coming back clean, and a round of antibiotics would clear up her issues. I never thought I would have a sick child. As a mother, I was angry. My husband and I shared the diagnosis right away with other family members and friends. Most had never heard of Ulcerative Colitis and immediately paired it with a form of IBS. I can’t tell you how much that bothered me! The next few weeks consisted of getting Alexis on a routine with her medications. Since she was so healthy up to that point in her life, she had very little experience taking any kind of medication. Most days we had to hold her down and force the medication down (and this took place several times a day!) During this time, I researched constantly. I wanted to know if there were any new advancements and I wanted to know what I could do to hopefully “cure” her. (I was unaware that it was impossible to cure unless a colectomy was performed for a good month believe it or not!) I felt that researching was my job, and I logged hundreds of hours in front of the computer screen talking to other parents and looking up various methods others used. I explained to anyone who asked everything I possibly could about IBD in general. Alexis did fairly well on sulfasalazine for a good 2 years. During this time she encountered several flares, but we managed them with a round of steroids and she managed to bounce back. In December of 2011, Alexis started having the worst flare we had ever encountered. We started her on another round of steroids and after a few weeks, we noticed very little (if any) improvement. 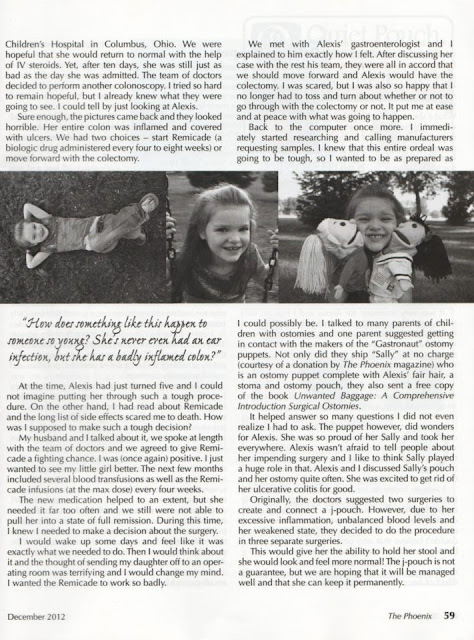 Eventually Alexis was hospitalized at Nationwide Childrens Hospital in Columbus, Ohio. We were hopeful she would return to normal with the help of i.v steroids, yet after 10 days she was still just as bad as the day we were admitted. The team of G.I Doctors decided to perform a colonoscopy and take a peek at her colon. I tried so hard to remain hopeful, but I already knew what they were going to see. I could tell by just looking at Alexis. Sure enough, the pictures came back and they looked absolutely horrible. Her entire colon was inflamed and covered with ulcers. We had 2 choices at that point in time. Start on Remicade (a biologic drug administered every 4-8 weeks) or move forward with the colectomy. At the time, Alexis had just turned 5 and I couldn’t imagine putting her through such a tough procedure. But on the other hand, I had read about Remicade prior and the long list of side effects scared me to death. How was I supposed to make such a tough decision? I couldn’t believe we were at this point, so soon after being diagnosed. My husband and I talked about it, and I spoke with the team of Doctors, and we agreed to give Remicade a fighting chance. I was (once again) hopeful. I just wanted to see my little girl better. The next few months included several blood transfusions as well as Remicade infusions (at the max dose) every 4 weeks. The medication helped to an extent, but she needed it way too often and we still weren’t able to pull her into full remission. During this time, I knew I needed to make a decision about the surgery. I would wake up some days and feel like it was exactly what we needed to do. Then I would think about it, and the thought of sending my daughter off was terrifying and I would change my mind. I wanted the Remicade to work so badly. We met with Alexis’ gastroenterologist, and I explained to him exactly how I felt. After discussing her case with the rest of the GI team, they were all in agreeance that we should move forward and have the colectomy. I was no longer in control of the decision, it had to be done. I was scared, but I was also so happy that I no longer had to think about whether or not to go through with the colectomy or not. I know it seems silly, but it put me at ease and at peace with what was going to happen. I immediately started researching and calling manufacturers requesting samples. I knew that this entire ordeal was going to be tough, so I wanted to be as prepared as I could possibly be. I talked to many parents of children with ostomys and one parent suggested getting in contact with the makers of Gastronaut puppets. Not only did they ship Sally for free to Alexis, they also sent me a book called “Unwanted Baggage: A Comprehensive Introduction Surgical Ostomies”. It helped answer so many questions I didn’t even realize I had. The puppet did wonders for Alexis. She was so proud of Sally and took her everywhere. Alexis wasn’t afraid to tell people about her impending surgery, and I would like to think Sally played a huge role in that. Alexis and I discussed Sally’s bag and her ostomy quite often, and she was excited to get “rid” of her Ulcerative Colitis for good. The nerves however came on full force the days leading up to the surgery. I knew what to expect, but not knowing how Alexis would react once it was all said and done that really bothered me. What if she resented me for doing this to her? What if she really had Crohns? What if there were complications? You can only prepare yourself so much. I knew that if we continued on the track we were on, things were never going to get better. We were going through with the procedure for all of the right reasons. I let go of all my fears and anxiety and did everything I could to make sure Alexis was comfortable and prepared. On July 11th 2012, Alexis and I packed up several bags and went off to the hospital. I will say that the bowel prep was probably the hardest thing she had to go through the entire week she was in the hospital. The nurses placed a tube down her nose that lead down to her stomach and fed her several gallons of some sort of mixture that would “clean her out”. It was very traumatic for Alexis, and I had no idea that it would be done like that. It is upsetting not knowing exactly what it going to happen beforehand. I was new to the surgery scene, so I didn’t even think to ask what kind of prep was going to take place. But, we made it through it through the night, and we were woken up around 7 am the next morning to prepare for the colectomy. Around 930 on Thursday, the OR called for Alexis. Reality immediately set in. The nurses rolled her down to the OR prep center. They started hooking her up to O2 sensors, gave her additional iv fluids, medication for her to relax and the surgeon and anestheologist came in and talked to my husband and I through what was about to happen. Everything that happened between explaining and dragging her into the OR room was a complete blur. All I know is that once they took her down the opposite hallway of the waiting room, I felt as if my world was crashing down all around me. During the waiting period while Alexis was in surgery, I couldn’t even describe any type of emotion I felt because I didn't feel anything. I was just lost. I napped and stared at the clock until our families arrived. The surgery itself only took about 3 hours once they got started. Originally we planned to do a 2 step procedure where they would remove her colon, create the ileostomy and the jpouch in one procedure and then reverse the ileostomy and connect the j pouch in the second. However, due to her inflammation, blood levels being so out of whack and the doctor not being 100% sure she has Ulcerative Coltis versus Crohns, he decided that the 3 step would be more beneficial. So we will be going back for procedure #2 in a few months as long as the pathologist confirms that it is UC in her colon (as the Dr confirmed there was NO inflammation in her small intestines he could see! -which would indicate Crohns) where they would create the j-pouch and then procedure #3 would be done a few months after that where they would reverse her ileostomy (basically close it up) and attach her pouch to the small intestines. This would give her the ability to hold stool and she would look and feel more normal! The j pouch is not a guarantee, but we are hoping that it is managed well and she can keep it permanently. 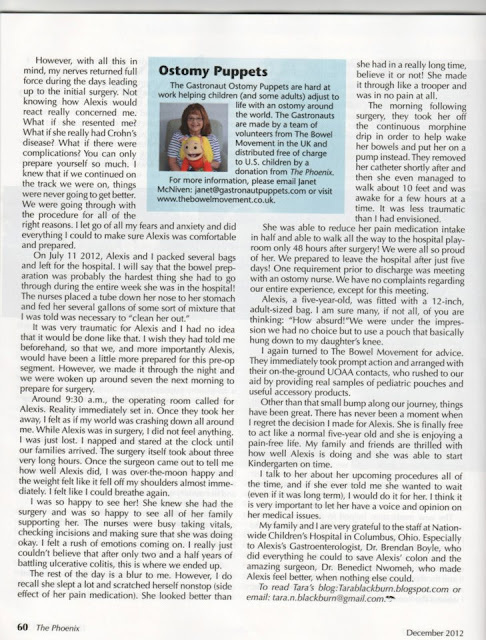 Once the surgeon came out to tell me how well Alexis did, I was over the moon happy, and the weight felt like it fell off my shoulders almost immediately. I felt like I could breathe again. She still had another hour to go in recovery, so we went to her room to wait for her arrival. The minutes seemed to drag on for hours on end, and I kept looking out the window to see if I could catch a glimpse of her being rolled down the hallway. After nearly an hour and a half wait, she finally showed up. The rest of the day is a blur to me. But I do recall she slept (alot) and itched herself nonstop (side effect of her pain medication), but she still looked better than she has in a really long time. (Believe it or not) But she made it through like a trooper, and was in no pain at all. The morning following her surgery they took her off of the continuous drip of morphine in order to help wake her bowels and they put her on a pump. They removed her catheter shortly after, and then she walked about 10 feet or so from her room and managed to stay awake for a few hours at a time. Less traumatic than I had envisioned for barely being 24 hours out from surgery. Just 48 hours after surgery she was able to cut her pain med intake in half and she was able to get out of the room and walk! She walked all the way to the hospital play room that day, and we were all so proud of her. Since Alexis did so amazing post- op, we were prepared to leave at just 5 days post op! One requirement prior to discharge was meeting with a WOC nurse to go over how exactly we would change Alexis’ bag and how to re-order supplies. I have no complaints regarding the entire experience we encountered, EXCEPT for this meeting with the nurse. Alexis was fitted with a 12 inch adult sized bag from Holister. I am sure every single one of you reading this is thinking “How absurd!” and I agree, one hundred percent. At the time, my husband and I had no idea what we were doing and decided to put all of our trust into everything she said. Well, to make a long story short she did a very poor job informing us as to what products were out there. We were under the impression we had no choice but to use a bag that basically hung down to my daughters knee, and the only product we left knowing about was the skin barrier powder for broken skin. Needless to say, we had a lot to learn on our own. But, other than that small bump along our journey, things have been great. I don’t regret one bit the decision I have made for Alexis. She is finally free to act like a 5 year old, and she is enjoying it pain free. My family and friends are thrilled with how well Alexis is doing, and she was able to start Kindergarten on time with her fellow peers. We have scheduled her second surgery for October 4th, 2012 and the final take down will be done towards the end of the year. We are hopeful things will go just as smoothly! We are expanding our family in March 2013, so it was important to me to have everything done prior to that date. I know life will be hectic with a newborn, and I want to make sure I can be right by Alexis’ side one hundred percent through this entire process. I talk to her about her upcoming procedures all of the time, and if she ever told me she wanted to wait (even if it was long term) I would do it for her. I think it’s very important to let her have a voice, and opinion on her medical issues. My family and I are very grateful to the staff at Nationwide Childrens Hospital in Columbus, Ohio. Especially to Alexis’ gastroenterologist Dr. Brendan Boyle who did everything he could to save Alexis’ colon and also the amazing surgeon, Dr. Benedict Nwomeh, who made Alexis feel better when nothing else could.